The holster is made for a H&K compact but works for other guns. Holster is in excellent condition. Pictured with M&P 9 Full Size and Glock 23 (guns not Included). Gould and Goodrich leather slapjack. Weighs 9 ounces. Excellent condition. Condition is Pre-owned. Fits GLOCK 17, 22, 31. Part of my dad's collection of firearm accessories. Per the images, this holster is in great shape. Original Police trade in Holsters. Gould & Goodrich 890-G19 Concealment In Trouser RH Holster Brown Fits Glock 19. Condition is New without Tags. If you have any questions or need more photos please feel free to ask!! Holsters for Glock 26 27. Brand new never used Gould and Goodrich leather ankle holster. A used but in good condition Fobus paddle holster. RH. No refunds or returns accepted. No international shipping. Thank you for looking. Gould goodrich holsterItem No: B733 4506 RH. Sorry for the lack of info but I know very little. Gould & Goodrich Black Shoulder Holster, Handcuff & Magazine Pouch (OAG 3LG). Condition is Pre-owned still in excellent condition. Shipped with USPS First Class Package. This holster fits X361 TASER. (Model X361 M26) Item for sale is a GOULD & GOODRICH Model X361 M26LH Phoenix Nylon Swivel Cross Draw Taser Holster with ATTACHED CARTRIDGE POUCHES.Model X361“Phoenix Advantage-Plus” Abrasion and moisture resistant. Gould & Goodrich X361 Phoenix Nylon Swivel Cross Draw Taser Holster with Pouch Model X361Right Handed M26 holster with 2 cartridge carry case attached. Thank you for looking! ** TASER &BELT LOOP/CLIP NOT INCLUDED. Shown for demo & sizing reference only! Gould & Goodrich 3 slot paddle holster for S&W Sigma 40F. Condition is Pre-owned. Shipped with USPS First Class Package. Fits Beretta 92F 92FS 92G 96 96G 96FS. Gould & Goodrich Holster. Triple Retention Duty Holster. We accept Often not cleaned. Glock 19/ H&K P2000 Leather Holster RH. Condition is New with tags. Thumb snap break style. New leather is stiff and takes a little while to break in but fits both weapons Glock 19 and H&K P2000. 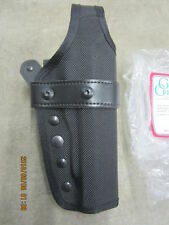 Gould goodrich holster Item No: 4006RH. Condition is New with tags. Sorry for lack of info but I know very little about this stuff. Unknown repairs may be required. Property may be viewed and picked up from 11 am - 5pm. Fits the Glock 19. I bought it and just have not used it much. It’s in Great condition. 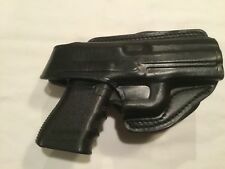 92fs Duty Holster Left Hand. Item is worn but functions fine. Snap closure works. Condition is Pre-owned. Shipped with USPS Parcel Select Ground. SEE PICS FOR DETAILS! Cool old leather Gould & Goodrich holster, w/ braided pattern. Well worn, but in good shape! Gould goodrich holsterItem No: B721A 590 RH. Sorry for lack of inf but I know very little. Gould and Goodrich size 32 RH holster for S&W K Frame 2"
Nice shape with vinyl outside and suede inside. Good snap and good strap. Looks nice. Gould & Goodrich gold line Shoulder holster Componets made of Premium Leather. GOULD & GOODRICH SHOULDER HOLSTER. AND COLT PYTHON. S&W MODELS 25,27,28,29,57,58. I'm not sure where this item was made.USA?. Right Hand IWB. S&W Bodyguard. 380. AMT Backup. Colt Mustang. Leather Holster. application for nice snug fit on both. This holster fits: S&W10, 12, 13, 14, 15, 18, 19, 48, 64, 65, 65LS. Pictured is the one that we consider to be in the worst condition. Item number: B501-34. G&G left hand paddle holster for the Sig 226 R or railed model. HOLSTER IS 9" x 4". HAS WEAR & CRACKS. Fits Kahr 380; Kimber Solo; Ruger LCP; Sig P238. The tension screws lets you adjust for a firm or easier draw. Tension screws lets you adjust for a firm or easier draw. WARNING WARNING: This product may contain chemicals known to the State of California to cause cancer, birth defects, or other reproductive harm. GUN HOLSTER IS 8 1/2" LONG & TASER HOLSTER IS 5" LONG. HAS WEAR & CRACKS . Gould & Goodrich #32 leather belt holster S&W K-Frame Colt rossi etc 2" & 2 1/2"
Gould & Goodrich leather belt holster size 32 right hand. Thumb break retaining strap is adjustable so should fit many short barreled revolvers. In excellent condition. Hello, this is a used leather pancake paddle holster for a Sig P226 made by Gould & Goodrich in right hand. This is a fantastic huge lot of Gould & Goodrich Phoenix Series holsters. I am not an expert and have described the item to the best of my ability. Photos shown are of the actual item. Gould Goodrich 3 Slot Leather Holster Brown 803-696. GOULD GOODRICH G20 HOLSTER DOUBLE POUCH Phoenix Series, Left hand/ side. Please view photos and ask all questions before bidding. Thank you. Very nice finish, shows a few rub marks and dents. No cracks and nice shiney finish. Shows little use. This is a used Gould & Goodrich right-handed Level 3 duty holster for full-size "classic" Beretta handguns such as the 92F, 96G, and M9 series. Gould Goodrich T727-2XL Body Guard Tan Brown Size BELLY BAND Holster 2xl 50-54"